Dental caries is one of the commonest diseases of childhood and management is particularly challenging in underprivileged populations. In recent years there has been increasing interest in silver diamine fluoride. However, it tendency to stain carious tissue black and potential to cause oral mucosal lesions limit its potential use. Nano Silver Fluoride ® (NSF), a new experimental formulation containing silver nanoparticles, chitosan and fluoride was developed to be an effective anti-caries agent without staining the porous dental tissues black. The aim of this study was to investigate the effectiveness of NSF. This study was conducted in a poor community in northeastern Brazil, where the public water supply is not fluoridated. All children were provided with a toothbrush, fluoridated toothpaste (1000 ppm F) and oral hygiene and healthy diet instructions before their dental examinations. Teeth were randomly assigned to receive either NSF (33,989.8 mg/mL) solution, left in contact with the tooth surface for 2 min, or water. Teeth were assessed using visual and tactile inspection after a week, five months and 12 months by an examiner blind to treatment. 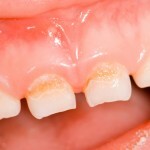 ICDAS II criteria were used to determine the activity of lesion and the diagnosis of caries. At 7 days, 81% of teeth in the NSF group exhibited arrested caries, whereas in controls, no teeth had arrested decay (p<0.001) [PF, prevented fraction=81%]. After 5 months, the NSF group had 72.7% with arrested decay, and the control group had 27.4% (p<0.001) [PF=62.5%]. Number need to treat (NNT) = 2. At 12 months, 66.7% of the lesions treated with NSF were still arrested, while the control group had 34.7% remaining arrested (p=0.003) [PF=50%] NNT= 3. At no time did the carious lesions of the NSF group turn black. NSF was demonstrated to be effective in arresting caries in children in poor communities. A systematic review and other studies have shown the potential benefits of silver fluoride agents for caries prevention. However, while they are low cost the black staining that results does inhibit their uptake. This new agent did not result in staining and produced a large arrested caries effect against a placebo. However, it is is a small study and as the authors indicate, further high quality studies are needed to test this and other alternatives application protocols. Dos Santos VE Jr, Filho AV, Ribeiro Targino AG, Pelagio Flores MA, Galembeck A, Caldas AF Jr, Rosenblatt A. A New “Silver-Bullet” to treat caries in children – Nano Silver Fluoride: A randomised clinical trial. J Dent. 2014 Jun 12. pii: S0300-5712(14)00164-X. doi: 10.1016/j.jdent.2014.05.017. [Epub ahead of print] PubMed PMID: 24930870.